The opioid epidemic is threatening to trigger a resurgence of HIV in Massachusetts, potentially undoing decades of work that had made the state a national leader in stopping the spread of the virus. A sharp uptick in new HIV cases among injecting drug users, who often share needles, has raised worries among health officials. They fear Massachusetts could experience an outbreak like the 2015 calamity in rural Scott County, Indiana, where one person introduced the virus into a network of drug users, and within four months more than 180 had become infected. “It would be a little early to say we have an epidemic on our hands, but we’re primed for it,” said Dr. Jenifer L. Jaeger, interim medical director of the Boston Public Health Commission. The numbers in Massachusetts remain small — 78 new diagnoses of HIV so far this year among people who inject drugs. But at this time last year, only half as many cases had been identified among this group. “This is likely to be an early signal of a potential outbreak. And we really need to address it right now,” said Dr. Alfred DeMaria, medical director of the Bureau of Infectious Disease and Laboratory Sciences at the state Department of Public Health. The renewed threat of HIV is the latest fallout from the continuing crisis of opioid misuse in Massachusetts, where an estimated five people a day die of overdoses. Late last month, the state health department sent an alert to every licensed physician and every health care facility, sharing the latest HIV statistics and urging doctors to ask patients about drug use, offer HIV tests, and refer patients to services that can teach them how to reduce their infection risk. 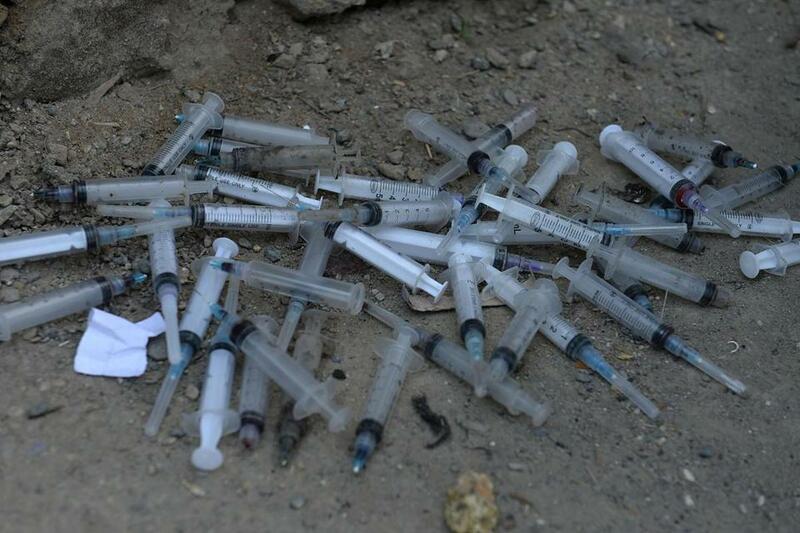 Unlike in Indiana, syringes are legally sold and distributed in Massachusetts, making it easier to obtain clean ones, and nearly everyone in the state has health insurance. But the two states share crucial similarities: a high rate of injecting drug use and a rise in hepatitis C, another blood-borne illness that can be spread by sharing needles, among younger people. Still, HIV is less prevalent and spreads less easily than hepatitis, and for a time it looked like cases were continuing to decline. “We’ve always worried about the potential for HIV to start spreading in injecting drug networks. We’ve looked for it in the past and didn’t find it,” DeMaria said. But as more cases were confirmed and the numbers continued to rise since 2015, it became clear that the tide was starting to turn. The current 2017 count of 78 is sure to increase significantly as more cases are identified, a process that can take months, DeMaria said. The health department has not yet identified an HIV outbreak in any single community, but disease-trackers are investigating possible clusters of cases to see if they are connected. Injecting drug users are especially difficult to find and track, DeMaria said. Many are homeless and move around a lot. When asked for an address, they often give their parents’ addresses even though they may no longer live there. Carl Sciortino, executive director of the AIDS Action Committee, a Boston-based agency that provides prevention and treatment services, called the state’s latest data alarming. “This is what I’ve been afraid to see happen,” Sciortino said. The spread of hepatitis C, and now the HIV increase, suggest that young people are not educated in safe needle use, he said. 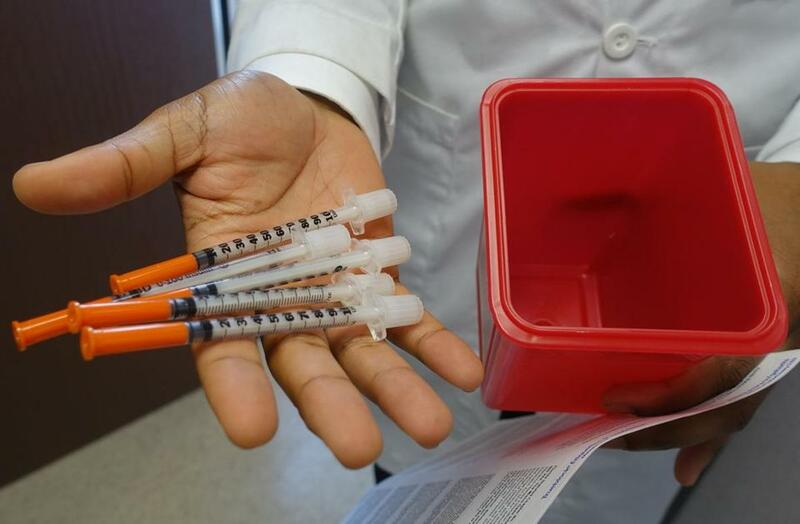 Needle exchanges, where drug users can obtain clean drug-injection equipment and other services, play a critical role in preventing the spread of disease. Needle exchanges, where drug users can obtain clean drug-injection equipment and other services, play a critical role in preventing the spread of disease. More than 20 are operating the state, up from only six in 2015. But Sciortino said that many people still live far from such programs. Another factor driving disease transmission is the prevalence of fentanyl, a synthetic drug that produces a more intense high than heroin, but wears off faster. As result, people inject more frequently, multiplying the opportunities for disease transmission. The bad news about HIV among drug users is especially striking in a state renowned for successfully controlling the disease’s spread. Over the years, an array of programs providing financial and social support to people with HIV has ensured widespread access to the antiretroviral drugs that enable most people infected with HIV to lead a normal life. Significantly, these drugs can suppress the virus to the point that it cannot be detected in the blood and cannot be transmitted to another person. By 2014, at least two-thirds of people with HIV in Massachusetts had totally suppressed the virus, compared with only about a third nationwide. Meanwhile, the number of new HIV infections diagnosed in Massachusetts fell steadily — in recent years down to almost half the 1,191 diagnosed in 2000. Most infections are spread through sexual activity, especially between men, and those cases have continued to decline. Among people who inject drugs, the number of new HIV diagnoses plummeted from 125 in 2005 to just 30 in 2014. In recent years, injecting drug users represented only about 4 percent to 8 percent of new HIV cases. But this year, they make up 15 percent. Even severely addicted people who are homeless can take the daily medications that treat HIV, provided they get enough support and assistance, Jaeger said. But that doesn’t come cheaply. A 2006 study estimated that a lifetime of HIV treatment costs well over $300,000. With most addicted people enrolled in the state’s Medicaid program, MassHealth, the state will pay for much of this care. Although people can be treated for HIV even while using drugs, the underlying problem of addiction still needs to be addressed, said Dr. Jennifer Brody, director of HIV services for the Boston Health Care for the Homeless Program. Brody noted that the most vulnerable groups, such as homeless people, often serve as the proverbial canary in a coal mine, presaging afflictions that will reach a wider population. Opioid overdoses were a primary cause of death among homeless people in 2003 through 2008, she said. A decade later, overdose deaths became a nationwide disaster. Correction: Because of an editing mistake, an earlier version of this article misstated the number of new HIV diagnoses in injected-drug users in 2014 in Massachusetts.